To avoid baggage fees, it is important to become well-informed about the ever-changing airline policies and fees. Thankfully, there are still a few carriers with limited charges for baggage. 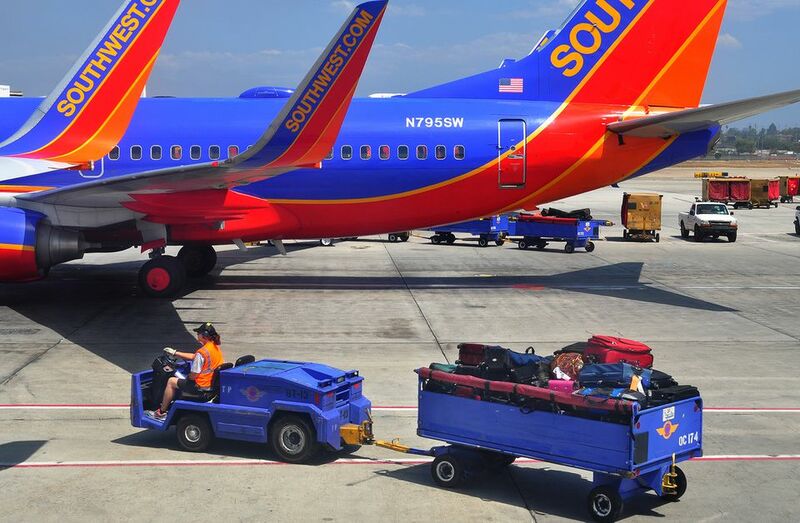 Two examples: Southwest allows two checked bags per passenger at no additional charge. JetBlue charges $25 for the first bag on a standard fare, but the bag is free under Blue Plus and Blue Flex fares. Many times, we have to book seats on an airline that imposes baggage fees. If the costs on airfares are similar, look at the way the airline structures its baggage fees. Take a look at baggage fees for major airlines and baggage fees for budget airlines. Rule of thumb: Many budget carriers will give you a break on airfares but charge higher baggage fees. If this is the case, you need to recognize the importance of one-bag carry-on travel. Would it surprise you to know that many travelers show up at the airport not knowing what they will pay for the privilege of checking their baggage? In this age of Internet access, there really is no excuse for this ignorance of the charges. You should print out the webpage on baggage fees for the airline of your choice and make it a part of your planning folder. It's important to realize that most airlines don't put baggage fee information on their home pages. You'll have to dig for it. Search "baggage fees" or click on the "site map" for the site and look through the organizational outline until you find the page you need. This might take a few minutes, but it sure beats showing up at the airport without a clue about these pending charges. Take a look upward from the in-seat movie screen and notice those baggage compartments. They were designed years ago, when checking baggage was free. People brought on a purse or a small bag with convenience items and stowed them in those compartments. These days, there's a mad rush to stow carry-on baggage in those bins, and on airlines such as Spirit, that action incurs a fee. Space fills up quickly, and on some flights, travelers have nearly come to blows arguing about the last available space. Most airlines have adopted an industry standard for carry-on bags. It's entirely possible that allowance will get smaller as time passes under our current system. With that in mind, it pays to know the limits, and know that your bag will pass the test at the gate. This has always been a good idea, but never more so than in this age of baggage fees. If you can limit your packing to one bag that is small enough to carry on, you'll avoid baggage fees altogether on all but a few low-cost carriers. There are other advantages: better mobility is important when you're trying to catch mass transit to avoid expensive cabs. It also improves the overall quality of your trip. Who wants to drag around several heavy suitcases? On some small commuter flights, no one can carry on their bags. But in these cases, if your one bag is smaller than the limit for carry-on bags, you usually are given complimentary checking. At smaller airports, you retrieve your bag right on the tarmac. All of this makes a lot more sense than dragging two or more bags on your trip. You've committed to one-bag travel. You've even checked the airline website to see the size limit for carry-on bags. But you're still going to be tempted to fill that one bag to the limit -- or perhaps over the limit. The best way to keep your packing honest is to buy a bag that imposes boundaries. This bag should also be durable and reasonable in price. Note that the absolute cheapest bag might not be the best buy if its construction is so flimsy that you'll need to replace it in a year or two. Check these recommendations for durable carry-on bags and see if one of them will fit your price range. If not, search for "carry on luggage" and find one that suits your budget. That reliable bag will tell you when you've packed too much. It's a common message that almost every traveler ignores: Lay out only what you absolutely need for a trip, and then leave half of it at home. If more of us would follow this advice, we'd be happier travelers. Quite a few trips have been significantly impacted -- or even ruined -- by bringing too much baggage. Now fees for checking baggage add even more pain to the equation. It's a sure bet that far fewer trips have been ruined by neglecting to pack enough. Check out some tips for budget travel packing and start thinking small. Then, pay attention to packing techniques to be certain you're using all your available space in the most efficient manner possible. Do you love to snorkel? Do you hate renting equipment other people have used? If so, you're likely to take up a good part of your one bag with a bulky mask, snorkel and perhaps even fins. But the outfit in this picture is designed to fold up into a very small pouch that will stow away in a small corner of your bag. That's right--it's designed to do that. It was made in an age when one bag travelers demand products that will help them be more efficient with limited luggage space. There are plenty of accessories on the market that help cut down on baggage fees. Find them, and do yourself a favor. By the way, the snorkel and mask work as well as any I have ever used. Don't sacrifice quality for the sake of efficient packing! One very common thread that runs through these baggage fees is a discount for paying online. It doesn't stop with baggage fees. Some airlines even make you pay extra for printing a boarding pass at the airport. There is little reason to pay these airport-related fees. Print your boarding pass in the comfort of your own home, and if you know you must check baggage, make the arrangements and pay the fee online when the trip is booked. You'll save money and you'll also gain the convenience that comes from avoiding those long airport lines. Paying for the inconvenience of standing in a long line is no way to start a budget trip. Isn't shipping a package that weighs more than a few pounds quite expensive? Before you answer, take a look at a comparison of shipping rates and baggage fees posted at Airfarewatchdog.com for a variety of suitcase sizes and weights. Sometimes, shipping a suitcase is actually less expensive than paying the baggage fees on an airline, especially if excess size or weight are involved. It pays to check into it once you've arrived at the smallest package possible. Beware: This strategy can backfire if your package(s) must be stored at the hotel prior to your arrival. Some hotels will charge fees for this -- and the smaller budget places you're likely to visit are even more likely to make you pay for this privilege than the larger chain hotels. There is a lot of talk these days about baggage fees, and rightfully so. Many of us can't get used to paying for something that had been free. Given the nature of airline economics, it's unlikely these fees are going to vanish. But don't become so focused on these fees that you wind up paying more for airfares. In other words, the airfare is still your primary concern. Focus on finding low airfares and you'll go a long way in the direction of budget travel. Be aware of baggage fees, and save money there whenever possible by finding the lowest fee possible. Better yet--go with one carry-on bag and don't pay the fees at all.